Though Fitbit has long rode high as one of the top wearables companies, it has begun to lose that grip in the past year, displaced by cheaper Chinese products on one end and the Apple Watch on the other. Enter the Ionic, Fitbit's vote that the high end is the better place to be. Let's get one controversy out of the way: many people have criticized the Ionic's looks based on photos and renders, but we can safely say that it's a much nicer device in person, at least in the "charcoal/smoke gray" combination we tested. It has a unibody metal frame that conforms nicely to the wrist, and if you buy Fitbit's $60 leather band, it may actually look reasonably stylish. The Ionic's bundled elastomer band isn't much to see, but is arguably more practical for fitness than Apple's Sport Bands, even the Nike+. We found it easier to put on and more secure, absolutely refusing to budge throughout the day or during long, intense gym sessions. The Nike+ is lighter and better cooled, mind. Another Apple advantage is in watchfaces. 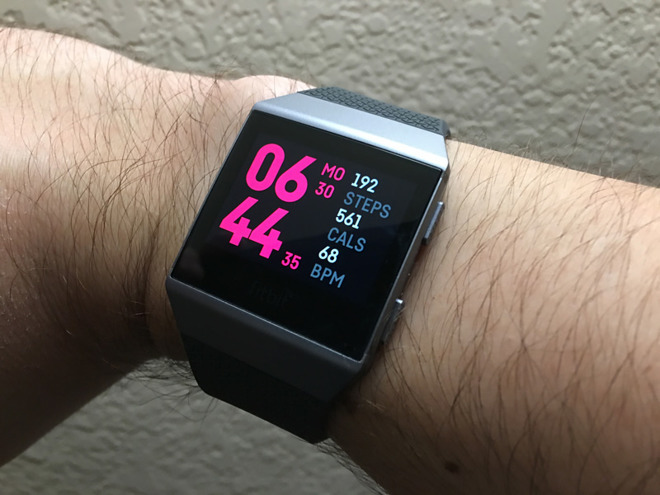 Fitbit is offering 17 faces as of this writing, some of which are genuinely attractive, but there's little in the way of customization (without beta firmware and desktop software), and the analog-style faces don't match up with the Ionic's aspect ratio. For us the best digital face was Stats, which includes an estimate of total calories burned —a complication Apple desperately needs baked into watchOS. It took surprisingly long to get the Ionic up and running. In the final tally, it was over 30 minutes before we could even jump into customization. 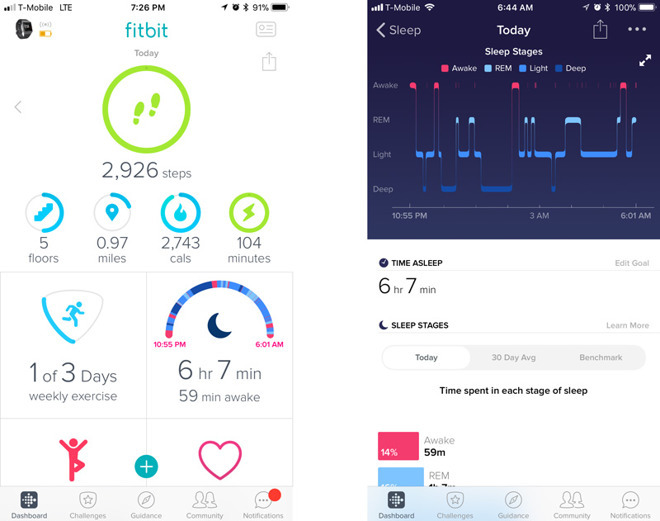 Thankfully, both setup and customization are handled mainly through the Fitbit iPhone app, which continues to be one of the best parts of any Fitbit product. It's simple to navigate, and its dashboard makes it easy to see up-to-the-minute statistics for things like steps, calories, goals, and sleep patterns. This even includes connected third-party apps like MyFitnessPal. It should be pointed out that if you're counting on Apple Health integration, this is not the device for you. The row between Fitbit and Apple continues, and while there are apps like Sync Solver ($2.99) which can bridge the gap, they sometimes have their own problems. If you don't care about Health, Fitbit's app will do. The most problematic thing for us was attempting to sync music. There's enough storage on the Ionic to hold a few hundred songs, and/or a handful of Pandora playlists if you have a Plus or Premium subscription. We had no trouble with the Pandora option, but the Windows 10 Fitbit app would always freeze in the middle of local music sync —a shame, since it was able to automatically detect our iTunes playlists. One of the things that distinguishes the Ionic as a full-fledged smartwatch is Fitbit Pay, an attempt at matching Apple Pay. This just didn't work at our local grocery store or Walgreens, however, even though it's marketed as working anywhere that supports contactless payments. We were able to use our Apple Watch at Walgreens. The main thing that's supposed to make the Ionic a smartwatch is a complete OS with support for independent apps. At launch, there are only three third-party options —Pandora, Strava, and Starbucks —but Fitbit has promised more, and even the device's native functions (weather, music, etc.) are treated like any other app. On their own Fitbit apps work about as well as you'd hope for, which is promising for the future of the company's OS. There's no convenient multitasking interface though, and the Ionic itself is underpowered, which makes navigating through the OS mildly sluggish. Control involves a mix of touchscreen gestures and three hardware buttons. These became second nature relatively quickly, and we appreciated the fact that it was harder to accidentally trigger commands during a workout than with the Apple Watch. 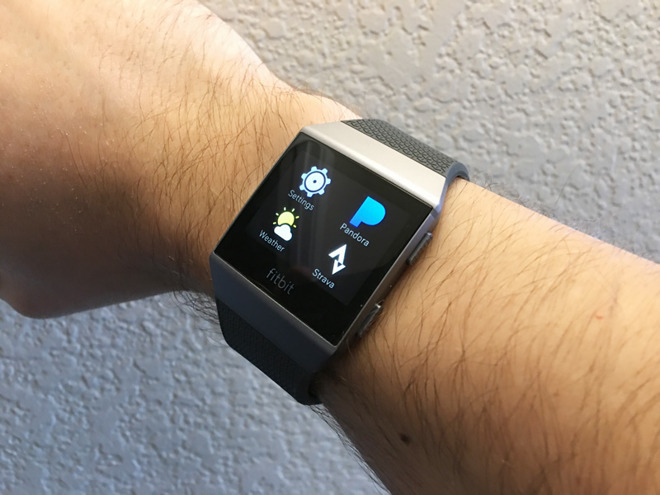 We didn't like the Fitbit OS notification system. It's functional, and the Fitbit app makes it easy to choose which apps get to ping your wrist, but all you can do is scroll through and expand alerts, not interact with them. The Ionic's sluggishness was most visible here too, making it annoying when we had to scroll through an entire list of notifications to clear them. There's no equivalent of Force Touch shortcuts here. What the Ionic does best, as we suggested, is workouts. Like the Apple Watch Series 3, it has a bright 1,000-nit display, water resistance to 50 meters (164 feet), and support for multiple geolocation systems —in this case GPS and GLONASS. Even its heart rate monitoring parallels the Series 3. We wore both devices during a series of extended workouts, and found them virtually identical in terms of tracking BPM, able to keep up with rapid changes and often within low single digits of each other. 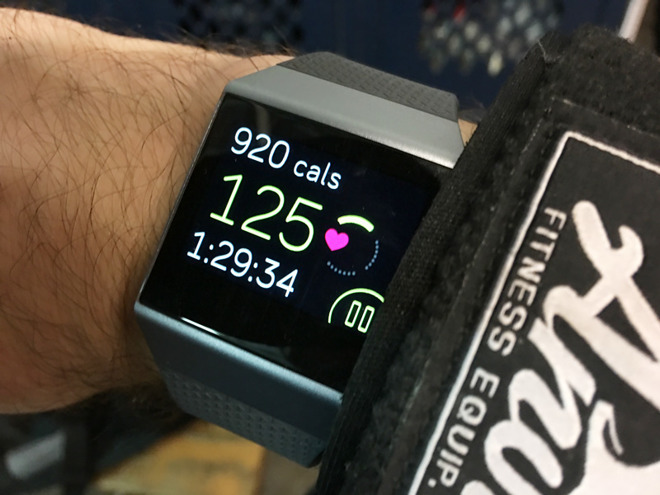 The Ionic typically registered more calories burned at the end of a workout, regardless of which device started recording first, but not by a wide margin. The Ionic offers a relatively small number of modes in its Exercise app, but does cover important bases and typically displays the right info when and where you want it. Some exercises can be detected automatically via SmartTrack, but it's best to manually log routines whenever possible. One app Apple might do well to copy in some respects is Coach, which includes a variety of workouts with audiovisual guides, and adapts to progress and recent activity. We'd note though that full access requires a $39.99 annual subscription, and if you're a gym veteran or looking to become one, Fitbit's routines skew towards the short side and are really just a launching point. You'll want to research training regimens on your own, especially since Coach is limited to bodyweight activities. An important factor we've yet to mention is battery life, where the Ionic trounces the Apple Watch. Fitbit claims the device can run up to 5 days on a single charge —we found that 4 days is probably more realistic with non-stop use and a few workouts thrown in, but that's still more than double what Watch users typically get, making it better for long-distance runners or people interested in sleep tracking. Of course, Garmin watches are the kings of battery life. At this stage it's hard to specifically recommend the Ionic. Not so much because of its hardware or interface problems, such as music sync, but because third-party support just isn't there yet. To compete with Apple, the product needs smarthome apps. Messaging apps. Ridesharing apps. Shopping list apps. The ability to take care of more basic functions from the wrist, in other words, instead of only receiving notifications about them. We're not even taking into account the Series 3 Watch's LTE connectivity, limited and costly as it is. As things stand, the Ionic is merely a good fitness product with higher ambitions. It costs enough that people who don't mind being locked into the Apple ecosystem should consider springing for an Apple Watch, and those who are concerned might want to explore Polar or Garmin if they're serious about fitness and want Apple Health. The Fitbit Ionic is available today at Amazon for $299.00 with free shipping. Best Buy also has the device in all three colors for $299.95 with free in-store pickup.